PT.Indosari Sarana Pangan Abadi is ManWinWin’s most recent client. The company is part of the Singaporean international group Radjawali Distribution Singapore and is responsible for the production of the leader brand Tip Top noodles, currently commercialised in Singapore, Indonesia, Malaysia and Brunei. 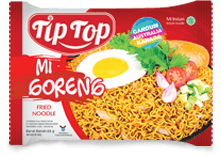 The company chose ManWinWin Software to handle maintenance management in its factory located in Banten, Java island, which is responsible for all Tip Top noodles production. Running since 2008, the 5 hectare factory employs 180 workers and produces 5 different flavours of instant noodles and egg noodles under the Tip Top brand. With an all-in-one manufacturing plant imported from Japan, it is able to produce 450 packed noodles per minute. The project was implemented by PT WinWin Indonesia, our regional partner in the country with headquarters in Jakarta, accomplishing another great step in the internationalization of ManWinWin’s brand throughout the Asia-Pacific market.